I love having a tan. Ever since I can remember, I have always been jealous of those with olive coloured skin and people who go really brown in the sun. I am naturally pale, and do not tan easily either. When I was younger, holidays meant tanning time. I was obsessed with getting a tan, so much so, that I would force myself to stay out in the blaring hot sun just so I could see those tan lines at the end of the day, even if it meant burning my skin. I don't even enjoy sitting out all day in the sun, I actually get really hot and bothered. I was so obsessed with getting a natural tan, that if I didn't, I would feel really down and depressed. It sounds so silly, but it really did mean that much to me! In more recent years, I would get a spray tan before going on holiday, which made me feel great when I first went on holiday. But after a couple of days the tan started wearing off, and I would come home paler than I went! 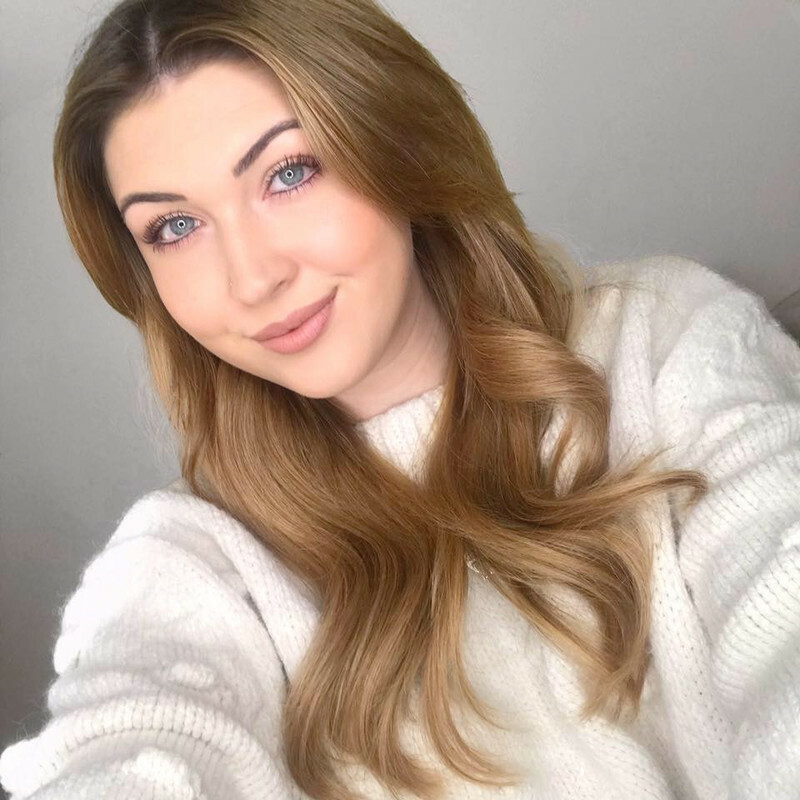 Earlier this year I decided to ditch the fake tan and try to build a bit of a base tan before I went on holiday using sun beds (sorry dad!). I was using them around 2-3 times per week, and if i'm honest, it was such a chore! I didn't enjoy the heat, and I felt guilty for using them because I know how bad they are! I carried on regardless because I was so desperate to achieve that natural base tan. One day, i'd gone to the tanning shop straight after finishing a busy day at work, having eaten nothing. I always went on for 6 minutes but after about 3 I started feeling really unwell, I was light-headed and the room started spinning. I had to come out of the booth after 4 minutes and somehow managed to pull my clothes on. As soon as I opened the door to leave, I had to sit down and then everything went black. It was such a horrible feeling, I was so embarrassed and so disappointed in myself for putting my body through that. I've not been back to the tanning shop since, and to be honest, I don't think I will step foot in a sun bed ever again. In a way, it was probably a blessing in disguise as it really did put me off for life! When me and Jack went to Gran Canaria, the weather on the first day was a little bit over-cast so we didn't apply as much suncream as we probably should have and both ended up really painfully burnt. It was a massive wake-up call to me, I was damaging my skin just for vanity! After that, I spent as much time in the sun as I wanted (not very long) and then sat in the shade the rest of the time. I still ended up coming home with a slight tan, but in my new mind set, that was just a bonus, not a necessity. I have accepted that I am never going to be one of those people who looks at the sun and gets a tan, i'm never going to have olive skin and i'm always going to get freckles and burn before I go any shade of brown. So i've decided to stop damaging my skin and obsessing over getting a natural tan. Of course, I am still very jealous of anyone who gets a gorgeous tan in the sun, but what i'm saying is, I have removed that pressure I was putting on myself to just tan on holiday. Having a tan does make me feel so much more happy and confident in myself and I feel so much better in clothes, so now I have accepted I'm never going to be naturally tanned, I have to fake it til' I make it. I have found the best range of tanning products that means I can have a natural looking tan without damaging my skin. 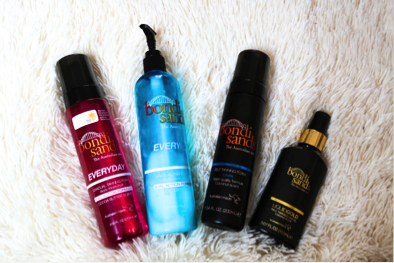 I was first introduced to Bondi Sands about a year ago, by a blogger called Sarah Ashcroft. She used the products way before they were available in the UK and she always has beautifully bronzed skin, so I knew I needed to try it out myself. The first product I ever tried was the dark tanning foam which is an overnight tan that comes out really dark. It's lovely but it is very high maintenance as it needs scrubbing off and re-applying every couple of days due to how dark it is. I tend to apply this one for special occasions and then have a long soak in the bath the night after to get it all off, as it's not really one I can wear everyday. Next, I tried the everyday tanning lotion (blue bottle), I absolutely love the smell of it and it is a lovely moisturiser. I think it's a good one to use on top of another tan to make it last longer as I didn't see much difference to my skin colour when I used it just on it's own. A lot of people recommend using this one on hands and feet with the dark foam to make sure you get an even tan on these areas. More recently, they bought out the liquid gold. This was introduced to me by another blogger called Lydia Millen. It was so popular that it was sold out in every shop for a while, luckily I had stocked up! It really is what it says on the bottle, it's such a beautiful colour and it is quite forgiving. The best thing about this product is that you can apply it at the start of the day and it develops throughout the rest of the day. Like all of the Bondisands range, it smells so good and never has that biscuit-like undertone. Finally, my favourite and their newest product. The gradual everyday moisturiser! I have already featured this in my best beauty buys this month which you can read here. But, I have to mention it again whilst i'm on the subject of Bondisands! This product is perfect for me as I can apply it at the start of the day and it never dries my skin out. It also gives me that perfect, streak-free tan. I hope you have enjoyed reading this little more personal post! Do you put yourself under pressure to tan? What fake tan is your favourite? Really enjoyed this post! I'm the same, I literally burn to get a tan and regret it so much... Does the bondi sands tan get in the pores of your skin because I haven't managed to find a tan (or a method) that stops this and I get dark spots where the tan is in my pores, particularly on my legs?